It was the early 70's. I was living at 5002 Eutaw Street, College Park, Md. I had a room mate named Dan Mayer. 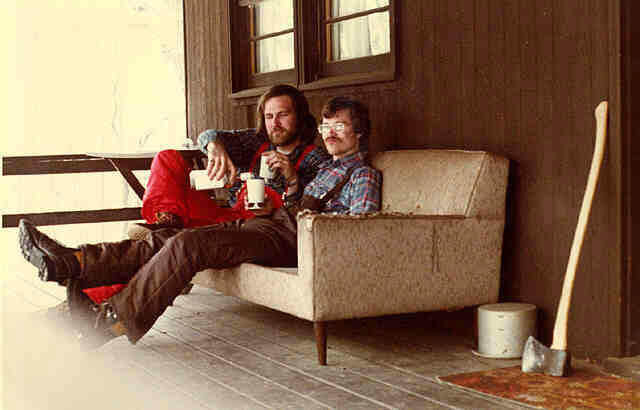 In about 1974, Dan and I got an idea one day to buy a cabin in the mountains. One that we could go to on weekends to hang out. Each weekend thereafter for several weeks, we drove all over the mountains of Virginia. Virginia was close only a few hours from College Park. One Sunday we saw an advertisement in the Washington Post the led us to area in the mountains of Virginia. Finally we found our "dream" cabin. The place was a completed shell, about 20 X 40 feet, and was in a subdivision called LOST VALLEY. After about a two hour drive from home, we would spend another 40 minutes driving up a long dirt road. At the very end was our cabin. 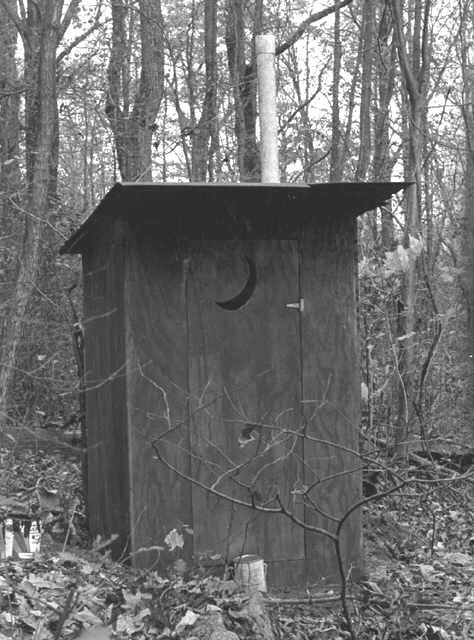 It was situated on 3 heavily wooded acres. There was no electricity or water, but it had a roof, four walls and was brand new. The total price was about $5,000.00. The company selling it would even finance it. I think the payment was about $150 per month. Cheap enough. We bought it, and started to move in. The first thing we did was buy an old iron stove. It was late fall and it would get cold soon. We went up that first weekend with my old truck pulling my house trailer. The truck was full of particle board for beefing up the floor and the old iron stove and a few feet of stove pipe. Oh yes, Rusty my collie was with us. We started for Lost Valley after work on Friday night. Half way there it started to rain. No problem, though, it rained there all the time. We expected to get up there about 11:00 PM and sleep in the trailer. 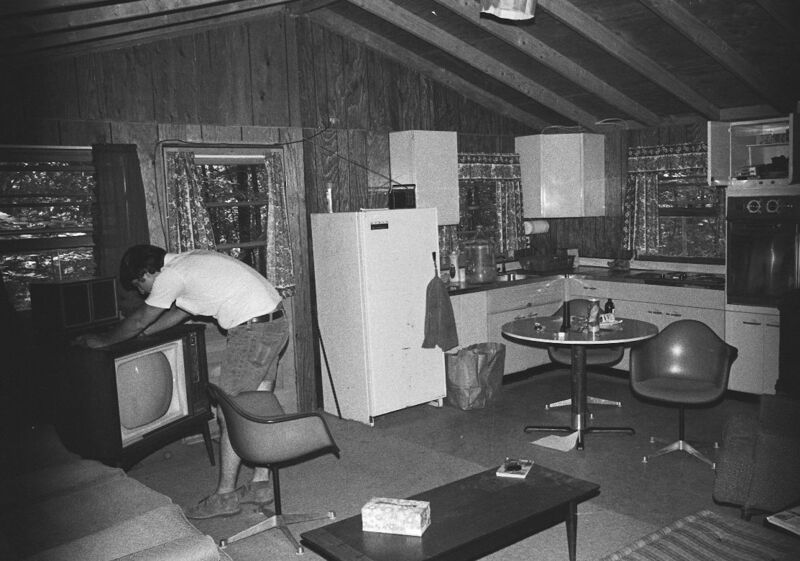 The next day, we would install the floor and hook up the stove. We felt that once we had that done, we could stay in the cabin. The trailer would be used just to get us started and allow us to not have to sleep in the unheated house. The trip up went well, until we got to the steepest part of the dirt road. I was a cautious driver. We only had 6 cylinders in this old truck, but it was a 3/4 ton and had a manual transmission. Half way up the longest, windey part of the road, the truck stopped. The load was so heavy, the trailer and the wood and all, that the clutch could not hold us. We only had the three speed and there was no compound low. There we were. Can't go up, and didn't think we could back down. It was dark and raining. I knew I had to do something. I thought we could back down the road and spend the night at the bottom. After that we could figure out what to do. So, Dan got out with the our old Coleman lantern and I started to back down this long road. This road was too narrow for anyone to pass so we kept hoping that nobody would come up. I also new that if the trailer started to "jack knife" I was dead. There was no way that I could pull forward. Slowly I backed down. Each inch I would check if I was going the right direction. As many know, backing a trailer is a little difficult. You have to turn the wheel the opposite way you are used to, then straighten it out before you go too far in any direction. Anyway, after about 45 minutes, we made it to the bottom. Once at the bottom we, of course, could not leave well enough alone. I had to prove that I could do the hill even under these conditions. I told Dan that the reason I got stuck is that I was going too slow. "Sure", Dan said, he was game for me to try it again. The rest of the weekend went pretty well. We got all our work done and spend the rest of our weekends up there fixing up the inside. My friend Richard Friedel lived near our house in College Park. His mother was currently re-doing her kitchen. She said we could have all her cabinets and counters. This included a complete electric range top and an oven. This was terrific. We had no gas, so when we brought in the electricity we would be set. Over the next years, we dug a water well, installed insulation, paneled and completed the inside and brought in electricity. We had everything. We even dug our own septic field. Drilling the well was fun. We first tried to drill it ourselves using the "drill your own well" kit that is sold in the back of many magazines. Of course this didn't work, but we killed many a weekend and spent many bucks on the project. There was a medium sized pond on the property that was full of catfish. I would spend many an afternoon sitting on the beach fishing. Rusty my collie loved the place. He would stand between the seats of my van for the entire trip up and back. He loved to go to the pond as well. Many a weekend was spent up there with our friends. Parties were not uncommon. The dogs had a great time also. We also enjoyed skiing from there. There was a ski area about 45 minutes away and we went regularly during the winter. I think this picture of me and "WM" Bowman was taken on one of the ski trips because of what we were wearing ! We finally sold cabin a year after I moved back to California. Someone at PBS wanted to buy the place so Dan and I sold it for $20,000. Each of us split the money as we owed nothing on the place. I used the money to help pay for our first house in Woodland Hills. 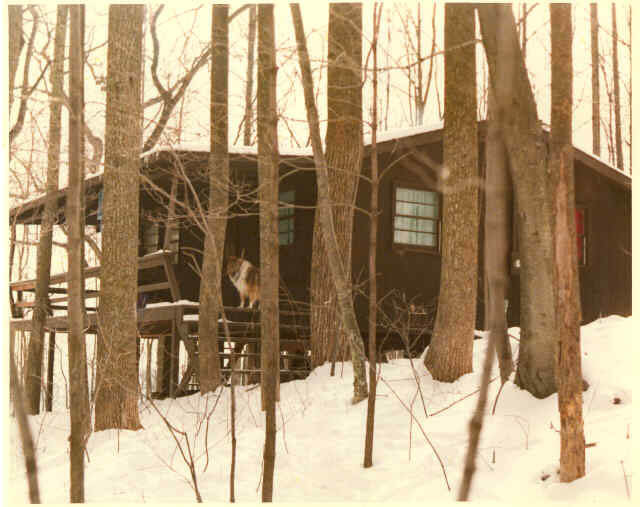 I have many terrific memories of our cabin. Even today, over 20 years later, I wish I had a place to go on the weekends. Maybe someday I will. Ah, Don't Forget the Jigsaw for the final decoration ! For My Photo Collection .